Team Rutt took an early one game lead against Team Brown in their best of 5 provincial championship at the Lakeshore CC in Nova Scotia. Games 2 and 3 at 2.30 and 6.30 Saturday 17th. BC's Provincial Championship will be held at McArthur Island (Kamloops) from February 2-5, though as only two teams submitted entries by the December 9 deadline, that schedule may be compressed. Team Cormack, last year's surprise winners over a Jim Armstrong team featuring Darryl Neighbour and Chris Daw, will defend their title over a team skipped by Darryl Neighbour. Details when available will be published here and on playdowns.com. BC were slow to adopt a playoff format for the Provincial team, but had 4 teams registered in 2009, and 3 in 2010 and 2011. This year's entry is very disappointing, considering how BC athletes have dominated the national team since 2007. Success at the national and international level is clearly no spur, at least in BC, to increased grassroots participation. The Bangor Daily News reports that Wes Smith died on Monday in Florida. 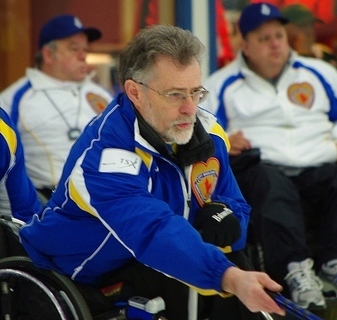 Wes played in the inaugural Wheelchair Curling World Championships in Sursee SUI in 2002. 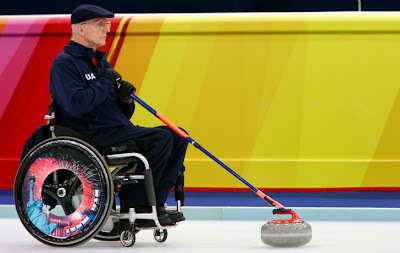 He was also, at 65, the oldest competitor at the 2006 Torino Paralympics, a record overtaken by Japan's Takashi Hidai who was 75 when he curled at the Vancouver Paralympics in 2010. The five athletes who will represent USA at the 2012 World Championships in South Korea next February 18-25, have been announced though playing positions have not yet been decided. and Tim Kelly (Rockford, Ill.) chosen as alternate. 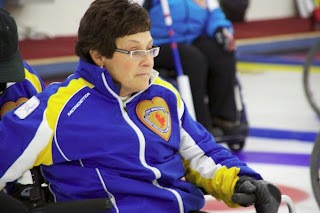 Players were chosen based on their performance at an open-call training camp and at the US Open and Cathy Kerr Spiel. USA lost their skip Augusto Pérez, 3rd Jim Pierce and lead Jacqueline Kapinowski to retirement after a tough 2011 Worlds campaign that saw them finish just one win above the relegation zone. This season they'll be led by Patrick McDonald who returns from shoulder surgery that kept him out of last year's championships. Experienced Jimmy Joseph and Penny Greely, last year's rookie alternate, return to the squad which has two newcomers; David Palmer and Tim Kelly. Rockford's Channel 13 TV station interviewed Kelly after he made the team. For those not beholden to national fundraisers like Own The Podium, wheelchair curling is about enjoyment - something easily forgotten amidst reporting's natural emphasis on competition and drama. Ilderton Ontario's program has been rebuilt on that firm foundation. The coach, Ernie Comerford, after relocating to London Ontario and looking to recreate the success he helped biuld in Calgary, saw Ilderton CC had the closest accessible ice. It also had a storied history, hanging three Canadian Championship banners plus the Torino Paralympic Gold Banner; a leagcy of Chris Daw's early involvement at the club. 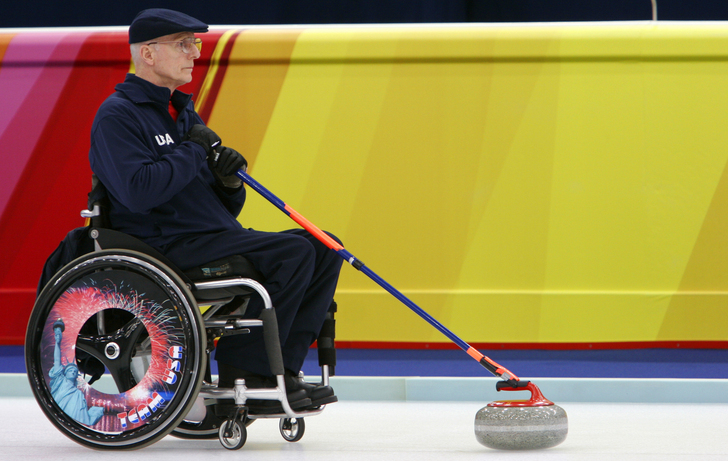 But participation had collapsed post Torino, and it took a whole winter to encourage the first two wheelchair users to enter the ice in the Spring of 2008. Since then there has been a steady growth in participation at the recreational level, while two teams played in this year's Cathy Kerr, one reaching the semis. Two players, Mark Ideson and Mike Munro, attended the National Training program and participated on Team Canada II in Richmond in November. This season the recreational group meets on Sundays from 11 am until 1 pm. 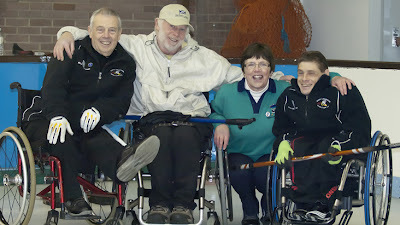 The competitive group plays in a regular mixed league weekly and attends separate practices during the week. 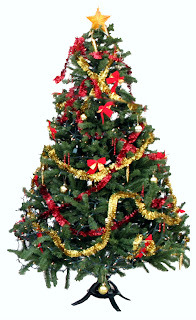 The Club intends to enter two teams in the January 2012 Provincials near Ottawa, with the hope that will expand to three in the future. The Club belives in outreach, and owns a set of demonstrations rocks to promote the game and recruit newcomers at local malls. Here is a video af highlights from the 2010-2011 season that gives a taste of the positive energy that motivates the club. Wheelchair Curling is alive and well in the London area and it keeps getting better, says Ernie. Anyone interested should contact Ernie Comerford at 519-203-0087 or by email at erniecomerford@rogers.com.